I was stunned when I came across this swag poster while going through pictures from San Diego Comic Con. I knew they were making a film, but I didn’t know when and how it would be coming out. I am relieved they did not recast Rube, but I am not sure how I will react to a new actress playing Daisy. After the departure of Rube Sofer, a new head reaper named Cameron Kane takes over. He's a slick businessman who couldn't care less about helping the newly dead. Chaos ensues and brings out the worst in Daisy and Mason who begin drinking anew. George and Reggie re-connect for the first time when George reaps a new friend of Reggie's (IMDB). The trailer looks interesting, and the story sounds interesting. 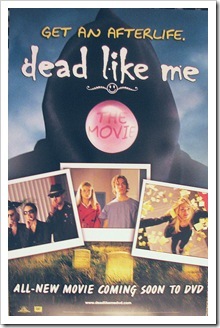 Dead Like Me was one of my favorite shows on TV. Season 1 blew me away. After Season 2, I waited for the show to return and when it didn’t, I got rid of cable. I cannot wait to get the DVD. It is still a mystery as to when it will come out, but it sounds like it will be sometime in 2009. There is a different trailer on their Official Site.